Range Rover Sport Interior, Sat Nav, Dashboard | What Car? 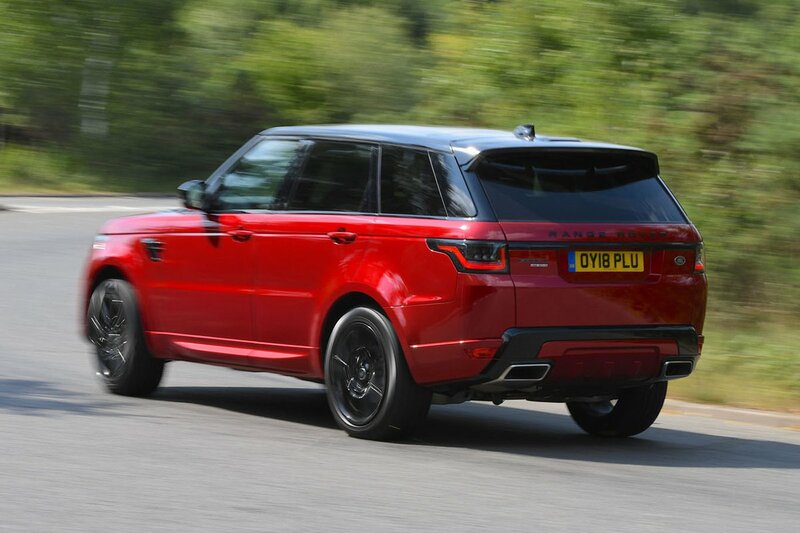 A lofty driving position has long been a Range Rover trademark – and even though the Sport model’s isn’t quite as commanding as it’s more expensive bigger brother, it still puts you at a height advantage compared to most other traffic. The pedals are nicely lined up with the driver and the electric steering column offers lots of reach and rake adjustment. 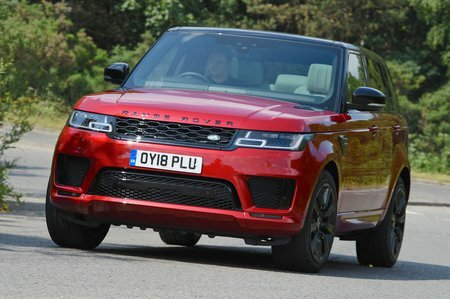 The seat itself is incredibly comfortable and supportive, although the SVR’s integrated head restraint is set slightly too low to be comfortable for tall drivers. All the controls – including the Terrain Response system that allows you to adjust the car’s dynamic settings to suit the surface you’re driving on – are within easy reach. Though not quite as high as in a full-size Range Rover, the driver’s seat is still a fair climb up and gives you an excellent view of the road ahead. You can see over hedges, walls and most other vehicles, so potential hazards will be easily spotted. This panoramic view also helps when trying to place the car on the road – particularly handy when you consider how much of the road the Range Rover Sport takes up. Vision directly rearwards and over the shoulder is fine, too. It’s limited a little by the tapering rear side windows, but this is no worse than in most other luxury SUVs. And besides, close-quarters manoeuvring is aided by standard front and rear parking sensors, as well as a rear-view camera. You can pay extra for an all-round camera system, which includes front, rear and bird’s eye views, or a self-parking system that’ll slot the car into a space for you. Fine night-time road illumination comes courtesy of standard adaptive LED headlights. 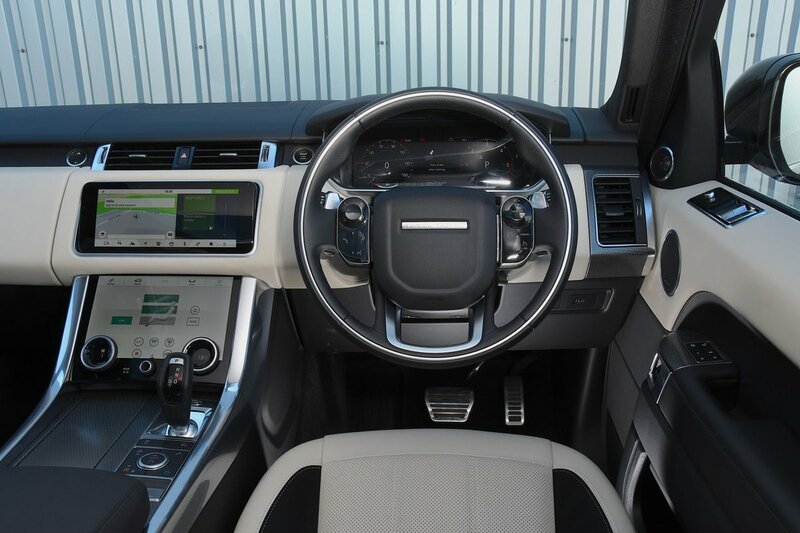 Like the smaller Velar, every Range Rover Sport has a pair of 10.0in touchscreens on the dashboard. One screen sits where you’d expect it to be, dominating the centre of the dashboard: the other sits below, in front of the gear selector. The lower screen is the one used to access the air conditioning and off-road modes, but you can also operate the multimedia system through it while the main screen displays the navigation. This layout certainly gives the interior an appealingly minimalist look, with a high-tech feel that’s helped by sharp graphics and only occasional lag when you select something. However, while the menus prove easy enough to navigate when you’re stationary, the lower screen can be distracting to use on the move compared with old-school physical buttons. It’s also disappointing to note that Android Auto and Apple CarPlay smartphone mirroring are only offered as an option, albeit at no extra cost on the HST trim level. There is also a free app from Land Rover that gives you a certain amount of smartphone connectivity, but our experience suggests that it can be a bit slow and cumbersome. The standard of the Range Rover Sport’s interior finish is very high; even if it's not quite as robustly screwed together as the Audi Q7's interior, it certainly has more 'wow' factor. There’s some impressive attention to detail on show, from the stitching on the leather upholstery to the numerous metal inlays. Leather upholstery comes as standard, and you can pay extra for more leather to cover the central part of the dashboard and the top of the doors for an even more luxurious, cocooning feel. The one real area of weakness is the plasticky feel of the switches. You'll feel a greater sense of satisfaction from operating the precise buttons you’ll find in an Audi Q7's.